Fully 16% of the HARI sample answered either “none” when asked how they identify themselves or gave one of the other answers classified equivalently (atheist, agnostic, secular, Humanist, or Ethical Culture). 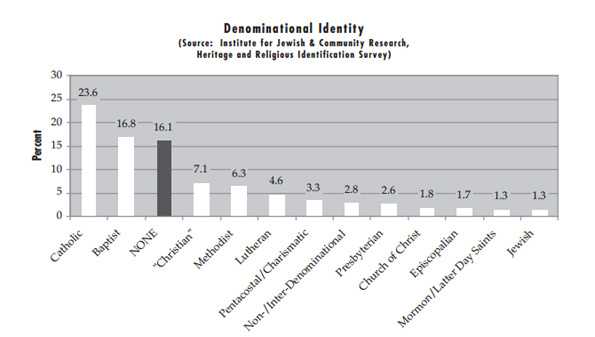 The largest number of non-identifiers (35%) were not raised in any religion as a child. Nevertheless, 62% of them had religious training or background. This compares with virtually all (97%) of respondents designating a current religion. 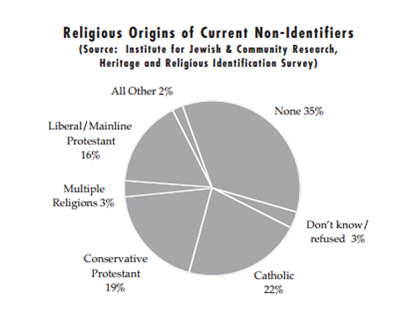 The fact that well over half of current non-identifiers were raised in some religion indicates substantial attrition in the proclivity to claim a religious affiliation. Movement in the opposite direction — from no religion to a current identification — is less extensive (26% of those raised in no religion now identify with some religious category). This opposite-direction movement — acquiring a religious identity after having none in childhood — is not nearly large enough to off set the elimination of identity among those with a religious upbringing. Among adults alive today, our calculation produces a net loss of about 8% in the number having a religious identity relative to when they were young.